Der Artikel Louis Joseph Ferdinand Herold (1791-1833): Le Pre Aux Clercs wurde in den Warenkorb gelegt. Es war Louis Ferdinand Hérolds letzte und gleichzeitig erfolgreichste Oper: Le Pré aux clercs, die 1832 an der komischen Oper in Paris uraufgeführt wurde. Nur wenige Wochen nach dieser bahnbrechenden Premiere verstarb der Komponist an Tuberkulose. Den Siegeszug dieser Oper belegen mehr als 1000 Aufführungen bis ins Jahr 1871, bevor sie in Vergessenheit geriet. Nun erscheint die Oper bei EDICIONES SINGULARES mit dem Gulbenkian Orchester & Chor unter der Leitung von Paul McCreesh. Hörprobe Track 5: Holà! ho! Hörprobe Track 7: Ah les chiens! Hörprobe Track 8: Allons! dressons la table! Hörprobe Track 9: Quelle rencontre inattendue! 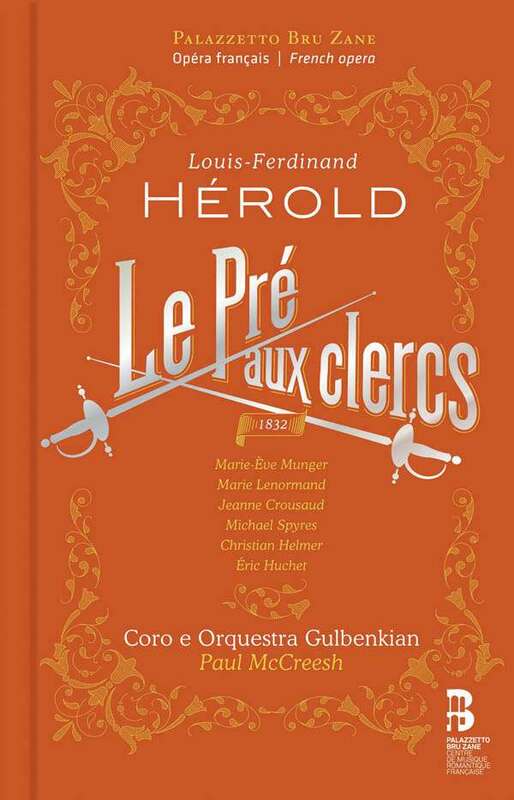 Hérold's "Le Pré aux clercs" (1832) was once one of the most popular of all French operas. Based on Merimée's novel "Chronique du regne de Charles IX" (1829), it covers, in a lighter fashion, themes similar to Meyerbeer's "Les Huguenots" (with Queen Marguerite de Valois trying to affect peace between the religious factions through marital diplomacy among the aristocracy—here the Protestant Baron de Mergy and the Catholic Isabelle de Béarn). 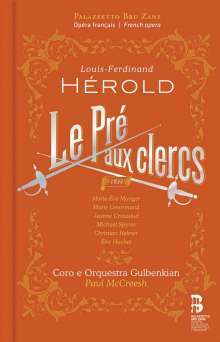 The opera represents Hérold's definitive legacy as a musician. It received over 1600 performances at the Opéra Comique alone, and some 2386 in Paris altogether until 1945. It survived in a broadcast recording under Roberto Benedetti in the 1950s, and as a famous set of highlights featuring the admirable Michel Sénéchal in the 1960s. In the 1980s. It was given by an amateur company in London in 1985, and in 1987 it was broadcast by by BBC Scotland under the splendid direction of José Serebrier with John Aler in the famous tenor role of Mergy. Only two years ago it was performed in Wexford, and now there is a fine commercial recording in the ‘book-opera' format by Palazzetto Bru Zane, the Institute in Venice devoted to the revival of 19c French opera. The masterpieces of Boieldieu, Auber and Adam have appeared in recordings, but Hérold has fared less well. The ballet "La Flle mal Gardée" which so delights people is available only in John Lanchbery very questionable arrangement, so it is excellent to have the composer's most famous work in this very attractive and scholarly edition. 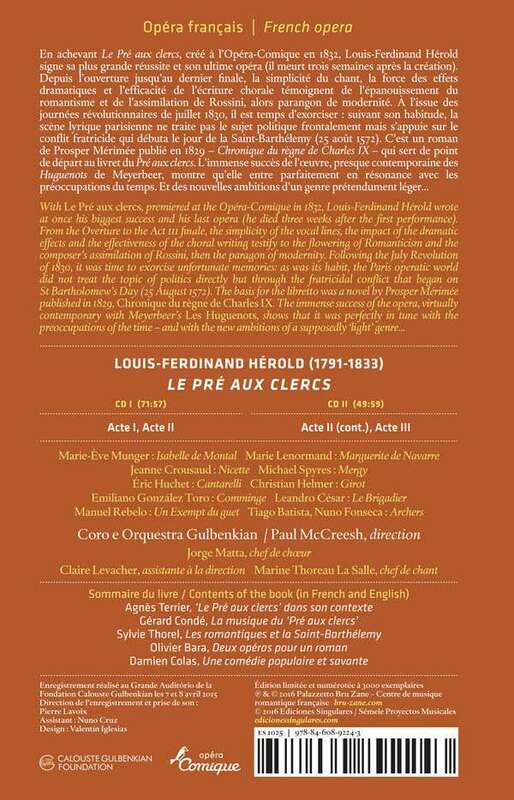 The two CD's fit into the front and back covers, while the centre is devoted to a booklet on the work, with four essays on the composer and the opera, and the full libretto, all in French and English translation. How wonderful, after the years of neglect, that this charming work should receive such attention appropriate to its status as one of the jewels of French Romanticism. The sadness is how it and the operas-comiques of the first part of the 19c were disregarded during the Belle Epoque and most of the 20c, with the new realistic and raw demands of verismo and intellectual sophistication of Impressionism. One of the greater challenges for all operas with dialogue is the realization and comprehension of the extensive spoken sections (often very long in opera-comique). Here performed by native speakers it is fascinating to hear it, and it can be skipped if preferred (the same is true of the old Decca recording of the delightful "La Dame blanche"). It is interesting to see Paul McCreesh so famous for his realization of so many religious works form the 17-18cc turning his hand of authenticity to bringing fresh life to this secular work from a later period. He and the Gulbenkian Orchestra responds very positively to the elegant contours and superbly crafted structures of this score: the overture is lucid, as are the finales to Acts 1 and 2, which have an architectural design and cumulative musical effect: the conductor must allow to the music to breathe and unfold to have its proper emotional effect. So many of the numbers became famous, and epitomize the light elegance of this French Romantic style permeated by the bel canto demands of a stringently schooled lyricism. The opening duet for the secondary characters of Nicette and Girot (‘Les rendez-vous', with Jeanne Crousaud & Christian Helmer) is the very epitome of this style, as are the tenor's solo (‘O ma tendre amie'). Michael Spyres is increasingly focussing on the repertoire created by the great Adolphe Nourrit, and here he shows himself in charge of this lighter but equally demanding role (created by Louis Ponchard. Isabelle's great aria in Act 2 (‘Jours de mon enfance') (beautifully recorded by Sumi Jo) is here performed with aplomb by the soprano Marie-Eve Munger with her crystalline displays of coloratura. This aria, still recalling Rossini but with a unique French nuance, especially evident in the rallentandi in the cabaletta, was the subject of correspondence between Richard Strauss and Hugo von Hoffmannsthal nearly 90 years later when planning the role of Zerbinetta in Ariadne auf Naxos, and was regarded as a supreme model of the florid style. The last act is characterized by the famous duel between Mergy and the fearsome Comminge on the Field of the Clerks, and shows a darker subtler side to the score. The sequence of the buoyant, hopeful unison trio, the impassioned duel duet, the gaming of the Archers of the Watch, and the funeral cortege of Comminge's body borne down the nocturnal Seine on a lonely barges, is unique sequence of love and death in opera. It makes the final outburst of the lovers and the assembled company a truly overflowing and liberating cry of joy. All this is realized perfectly in this recording.